I was recently down at 'Anchor Surplus' in the Nottingham Cattle Market when I came across the bell (shown above) which we used to sound at the end of every period. The bell used to be located just outside the science room and had the inscription TSS WAIMANA cast into it. The bell is unmistakeable as it has hammer marks on it where it has been struck on the outside. Surely there cannot be two bells bearing the same name? Does anyone know any more about this bell and how it has ended up at the Cattle Market? I was at Cottesmore Boys School until 1963. 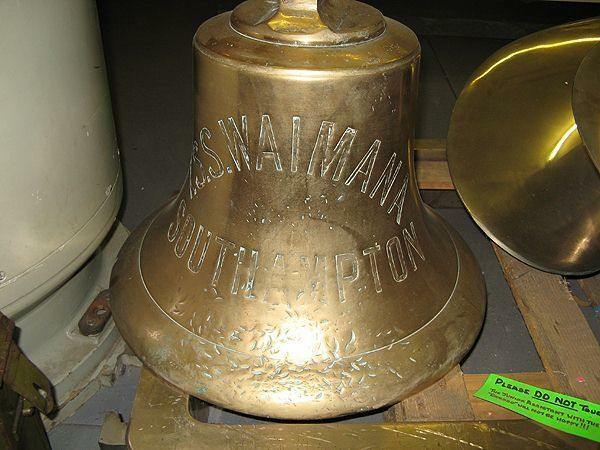 I have a feeling that pupils used to write to the ship's company of Waimana and when the ship was broken up the school was given the bell. I am certain that I have heard this story somewhere. Steamship Line: Shaw Saville and Albion Co. Ltd. When the Waimana set out from London in January 1952 for Milford Haven and the shipbreakers, she brought to a close an even longer record of over forty years' service to her owners. Built in 1911 by, Workman, Clark and Company, Belfast, she was a coal burning steamer propelled by two steam reciprocating engines, and like her consort the Pakeha had a speed of 13Â½ knots. She had over 300,000 cubic feet of insulated space and provision for emigrants. On her first voyage from Liverpool, beginning on Christmas Eve, 1911, she carried many people who keen to find new homes in New Zealand. The Waimana earned fame early in World War 1 when in October 1914 she sailed from Auckland with 1,600 men and 500 horses on board. the troops being part of the Auckland contingent of the famous Main Body. On a later occasion the ship encountered an enemy submarine in the Mediterranean, but thanks to the spirited defence put up by her single gun, the submarine broke off the action. After the Armistice, she resumed her peacetime role of carrying cargo and emigrants. After 1925 she ceased to carry the latter. In 1926 she was chartered by the Aberdeen Line, renamed Henninius and carried cargoes to and from Australia, apart from one memorable voyage as a troop transport to Hong Kong and Shanghai at the time of trouble there in 1927. She reverted to the Shaw Savill Line in 1932, and took back her old narne. At the outbreak of war, the ship was laid up in the Gareloch. As described earlier, the Waimana was purchased by the British government in September 1939, together with her consorts Pakeha and Mamari and converted into a decoy warship at Belfast. The Wairnana resembled the "Royal Sovereign" class. When she had finished her role of decoy in 1941, she proceeded to Newcastle to be reconverted back to a cargo ship. This was done without undue alteration, and the ship put to sea again in February 1942 as the Ministry of War Transport's Empire Waimana under the management of Shaw Savill Line. Until the end of the war she was employed on various services, including the North Atlantic, with cargoes from the United States. In 1946, the vessel was purchased back by her previous owners, and once again took the name Waimana and resumed her normal peacetime occupation. During February 1951, she added further distinction to an already honourable career, by towing 300 miles into Melbourne, the Panamanian freighter San Leonardo (7,176 tons), which had lost her propeller five days previously while bound from Chemainus on Vancouver Island to Adelaide. and was in danger of drifting ashore near Cape Northumberland, South Australia. Dear Sister and Brother, I hope this finds you both well. As I am thankful to say we are all well and have not been sick. We have had a stormy passage this far and have only been able to go 9 and 10 knots an hour. So we will likely be 6 or 7 weeks on the voyage. This is not a passenger boat. But a large cargo ship all her holds have been fitted up for us immigrants we don't have much accommodation but its all new wood and clean and we are the first passengers. We have plenty of good food so if we look at all our mercies we canâ€™t complain. There are 868 passengers on board beside the crew which are numerous. There are measles on board but I'm glad all the bairns are well as yet and I hope they won't take it. This is a very mixed crowd. laufle and Nicol were very kind to us and we were all up at Nicols and had tea and they saw us on the train for London. Bobbys wife and her cousin met us at London and saw us on the train for Southampton so you see we got on as smooth as if we had known the way thank God for all his mercies. On the train from Edinburgh to London next carriage to us was a married couple and family belonging to the Brethren awful nice people. I have met another family too belonging to the Brethren all Scotch people so we all gather together and we are getting to be like one family. It was awful on Sunday no devine service. English were knitting dancing singing songs playing cards and we Scotch people gathered together to sing hymns and got a touch at the piano. Well dear Betty I wonder how you are all at home. Oh how I miss you all. Its heart rending when I think I cant see you all again. But I trust we will meet again where there are no more partings. I have got an order for a jumper from Mrs Wilson the woman I met on the train. I am sorry they are not going to Wellington. But we have given each other our addresses to Mite to. I am just writing this now in case it may be posted at sea if we meet a homebound ship. We may not be allowed to go ashore at the Panama for this outbreak of measels. Some people have been very sick and are only getting on deck, everyday we see new faces I'm glad to say we have all of us never missed a meal but sometimes we didn't eat much. I have knitted a pair of socks for John and started another pair the women gather round us and wonder how we can knit so fast. Well dear Betty I hope you get this few lines all right and be able to read it the boat is rolling so much I have to stop writing and hold on. I hope you Will write me and tell me all your news for I will be so glad to hear from you. I hope Jamie is keeping well. Give my love to everybody Jessie and Jeanie and the bairns. So dear Betty I'll stop at this time trusting this finds you both well, the bairns all join me in love to you with everlasting love. This letter was written on board the Waimana by Ursula Irvine (known as Cecilia), to her sister Betty Halcrow in the Shetland Islands. Ursula Irvine (nee Halcrow) was born at Hoswick, Shetland Islands, Scotland in 1878. She emigrated to New Zealand in 1926 along with her 6 children: Elizabeth, Lourence, John, Malcolm, Jemima and Marion. The Waimana left Southampton on February 4th, 1926 and arrived at Auckland on March 18th, 1926. Her husband John Irvine had come out to New Zealand in 1924, as a seaman on the ship "Konini". He was on board when the Konini was wrecked near Bluff . Ursula (Cecilia) Irvine died at Wellington in 1928. This letter well describes the conditions on board and is possibly a reason why my father never discussed this voyage with his family. Dad started life as a Marine Engineer ,working for North Eastern Marine on the Tyne. In Dunedin he finally became a highly qualified Civil & Mechanical Engineer and then moved on to Australia. As for those terrible English people described in the above letter, then I am certain my grandparents would have been in that group, as grandmother loved her cards, which subsequently became banned in our house. Dad had seen enough of them. Grandma Bird, nee Rose Hannah Hubbard, was a "Brum" from Coleshill, Warks. Incidently the prefix "T.S.S." appearing before a ship's name normally stands for "Twin Screw Steamer"